On the longer term monthly chart, EUR/USD seems poised for a fall to 1.05. 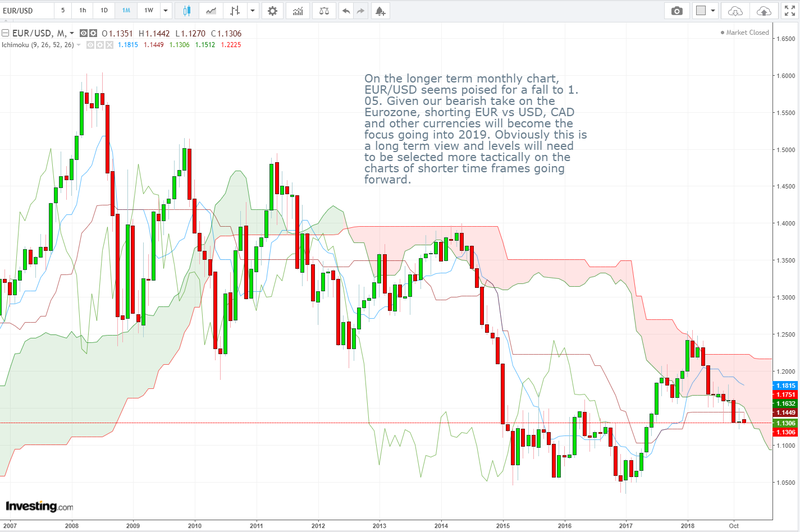 Given our bearish take on the Eurozone, shorting EUR vs USD, CAD and other currencies will become the focus going into 2019. Obviously this is a long term view and levels will need to be selected more tactically on the charts of shorter time frames going forward. Vee, our Founder/CIO highlights patterns/formations on selected chart(s) every week which may have the potential to turn into trading opportunities. These charts are first sent out on Monday of the week to members of our weekly subscription product – “CIO’s Week Ahead Update”, which helps to filter out the noise and condense only what’s important in the markets for the week ahead. The Hang Seng Stock Index (Hong Kong) is trading better recently. 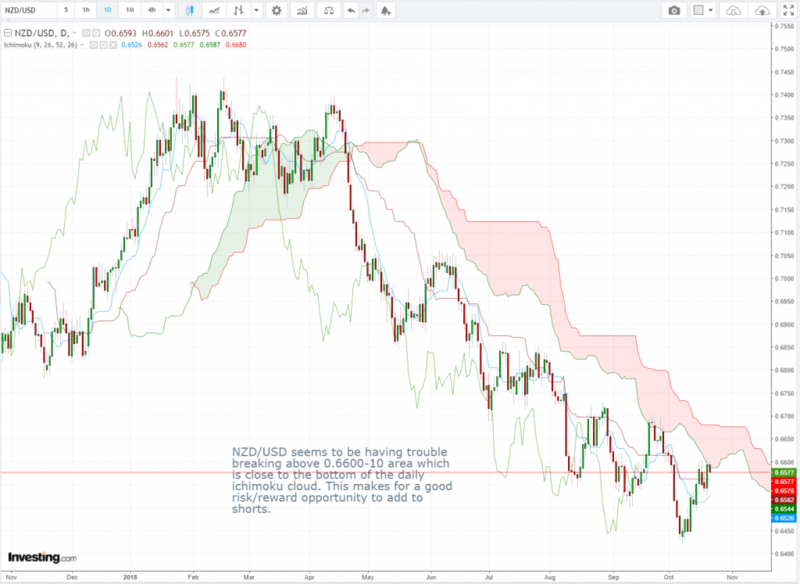 It is currently testing the daily ichimoku cloud, and will be a strong positive sign should it manage a close above the cloud. Is this just shortcovering ahead of the meeting between Trump and Xi at the G20 Summit or is it something more? 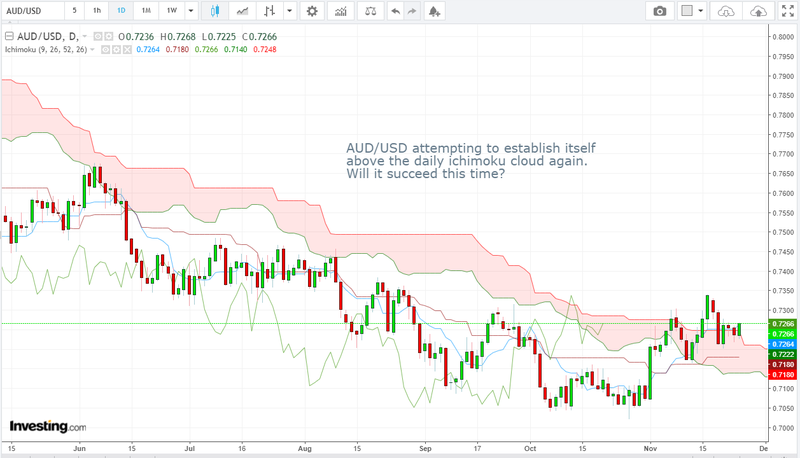 AUD/USD attempting to establish itself above the daily Ichimoku cloud again. Will it succeed this time? 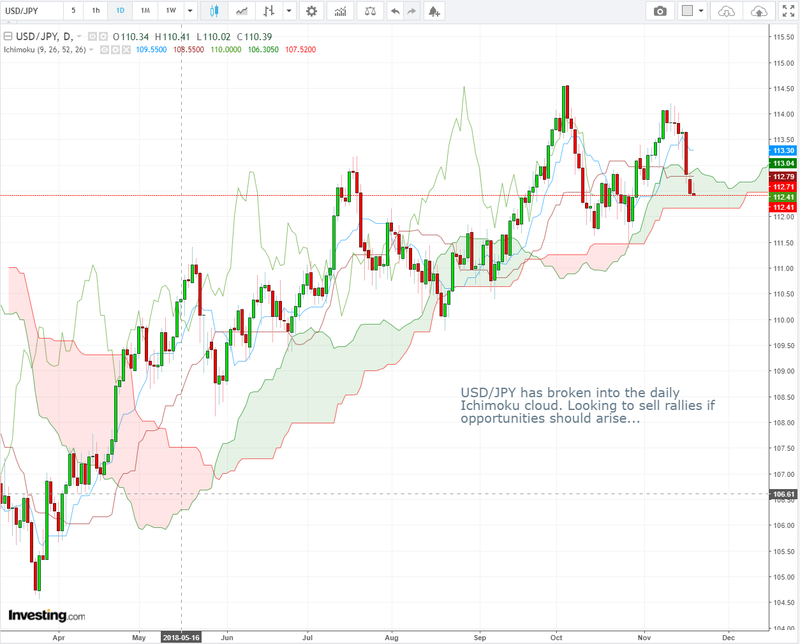 USD/JPY has broken into the daily Ichimoku cloud. Looking to sell rallies if opportunities should arise. 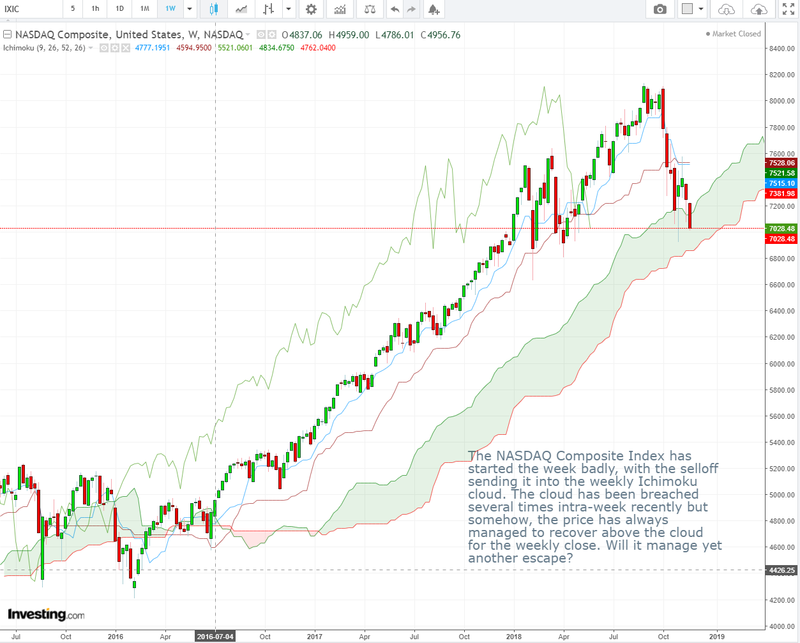 The NASDAQ Composite Index has started the week badly, with the selloff sending it into the weekly Ichimoku cloud. 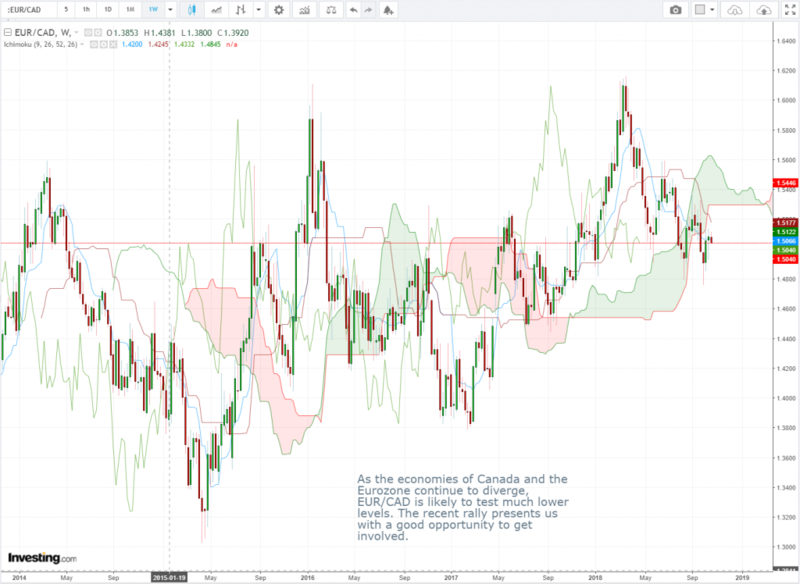 The cloud has been breached several times intra-week recently but somehow, the price has always managed to recover above the clouds. With the bearish close on Fri, shorting AUD/JPY with a stop above the recent highs gives us a good risk vs reward short based on the daily chart. Vee, our Founder/CIO highlights patterns/formations on selected chart(s) every week which may have the potential to turn into trading opportunities. These charts are extracts of our weekly subscription product – “CIO’s Week Ahead Update” which provides analysis for the week ahead, first sent out on Monday of the week. 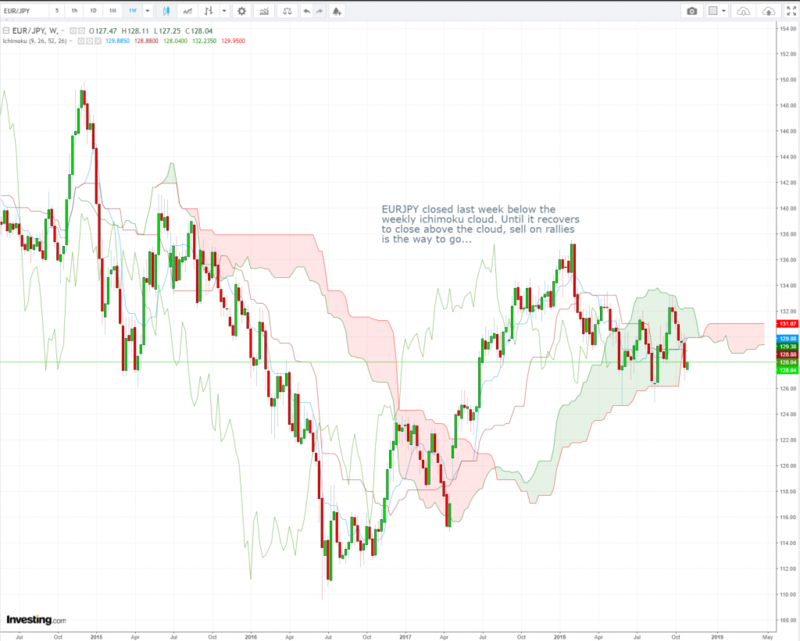 EUR/JPY closed last week below the weekly Ichimoku cloud. 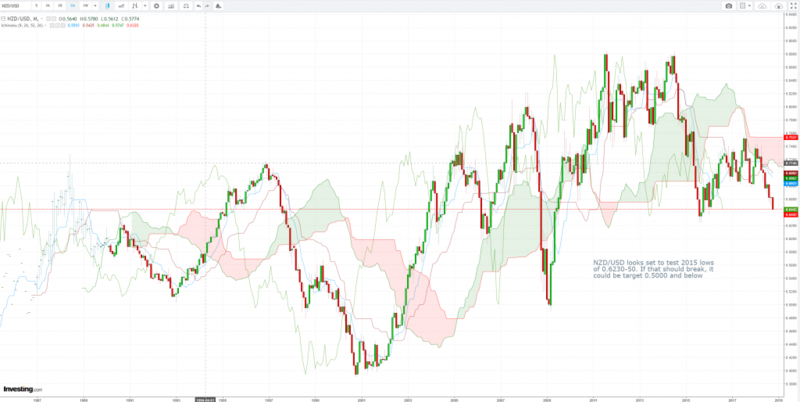 Until it recovers to close above the cloud, sell on rallies is the way to go. 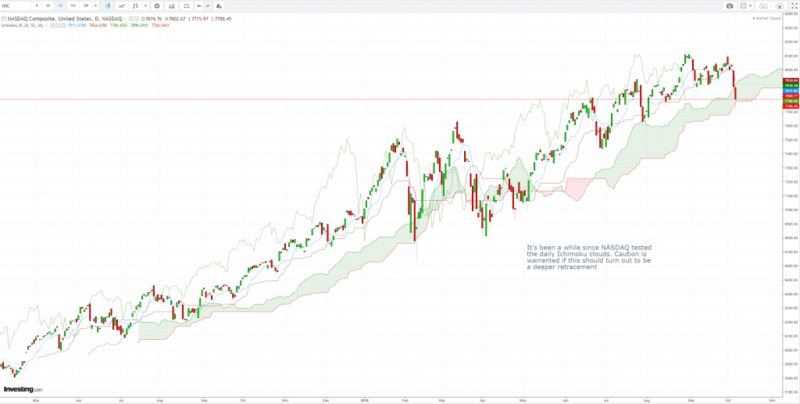 The NASDAQ Composite Index has not traded below the weekly Ichimoku cloud since mid 2016. It is now trading near critical support levels. A close below the cloud will be quite damaging to the longer term technical picture. As the economies of Canada and the Eurozone continue to diverge, EUR/CAD is likely to test much lower levels. The recent rally presents us with a good opportunity to get involved. Bitcoin (BTC) jumped to hit highs of 7700-7800 within minutes yesterday before falling back to below 7000. 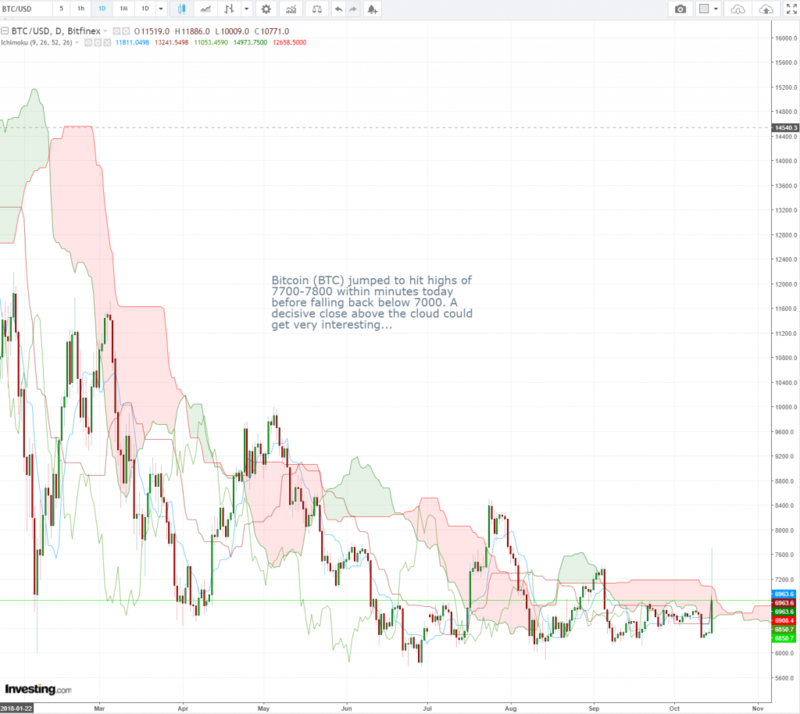 A decisive close above the cloud could get very interesting. As cautioned in last week’s report, a correction on NASDAQ is on the cards. The support on the weekly chart is at 7100 level. NZD/USD looks set to test 2015’s lows of 0.6230-50. If that should break, it could be targeting 0.5000 and below. It’s been a while since NASDAQ tested the daily Ichimoku clouds. Caution is warranted if this should turn out to be a deeper retracement. 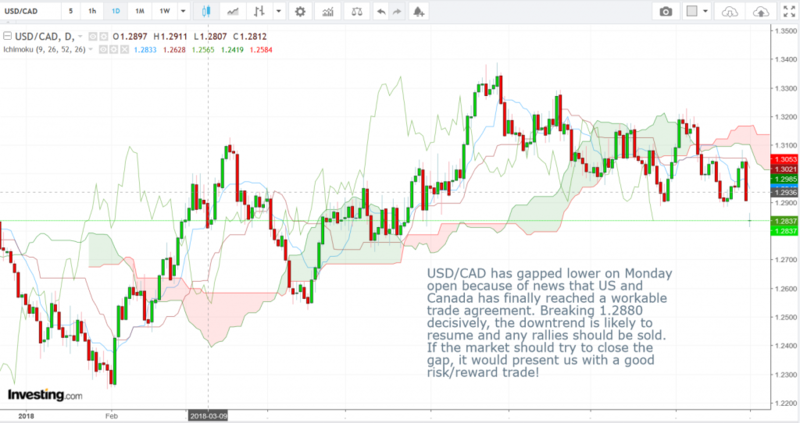 USD/CAD has gapped lower on Monday open because of news that US and Canada has finally reached a workable trade agreement. Breaking 1.2880 decisively, the downward trend is likely to resume and any rallies should be sold. If the market should try to close the gap, it would present us with a good risk/reward trade! 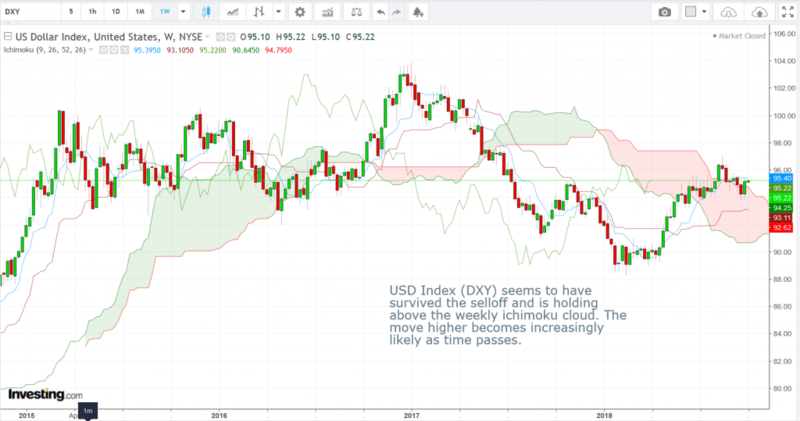 USD Index (DXY) seems to have survived the selloff and is holding above the weekly ichimoku cloud. The move higher becomes increasingly likely as time passes. Note: Periods of curve inversion (i.e. 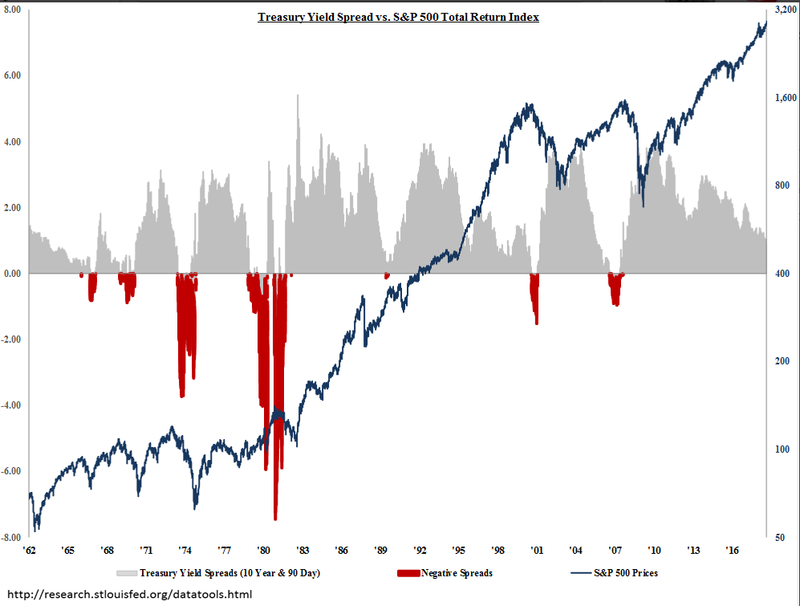 when the 3-month Treasury yield is higher than that of the 10-year yield) led to periods of correction in the S&P500 Index. Currently the spread is still far from inversion territory despite all the attention on the flat 2-yr vs 10-yr Treasury spread. 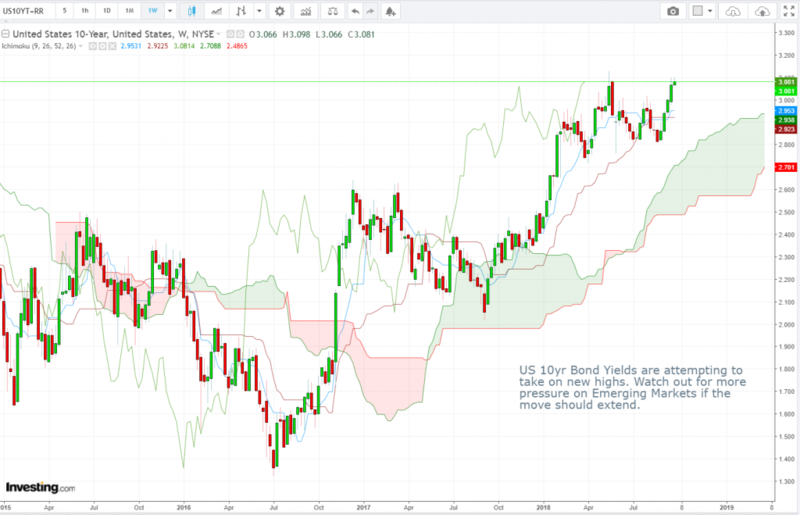 US 10yr Bond Yields are attempting to take on new highs. Watch out for more pressure on Emerging Markets if the move should extend. Disclaimer: The views and opinions expressed in this material do not constitute a recommendation by TrackRecord Pte. Ltd. that any particular investment, security, transaction or investment strategy is suitable for any specific person. No part of this material may be reproduced or transmitted in any form or by any means, electronic, mechanical, photocopying, recording, or otherwise, without prior written permission of TrackRecord Pte. Ltd.